Preheat oven to 425 degrees. Grease a muffin pan. 1. Whisk the eggs together in a small bowl. Add the buttermilk and vanilla. Set aside. 2. In a medium bowl, mix the flour, oats, sugar, baking soda, baking powder, salt, and cinnamon together. 3. Make a well in the dry ingredients and add the liquid ingredients. Stir only until combined. Add the cinnamon chips. 4. Drop the batter into the greased muffin cups. Mix the two tablespoons sugar and 1/2 teaspoon cinnamon together. 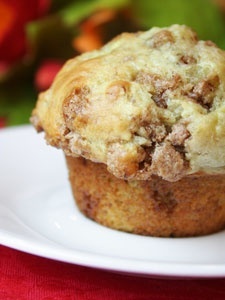 Spoon the cinnamon sugar over the muffins. 5. Place the muffin pan in the oven. Immediately turn the temperature down to 375 degrees. Bake for 15 minutes or until done. Baking times will vary depending on how well your oven holds heat. Cool the muffins on a wire rack.